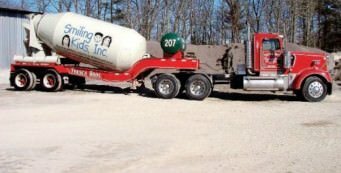 Ready Mix Concrete and related materials in the MetroWest Boston area. For ready mix concrete in MetroWest Boston, click one of the buttons below. Click here to learn about our ready mix concrete products. 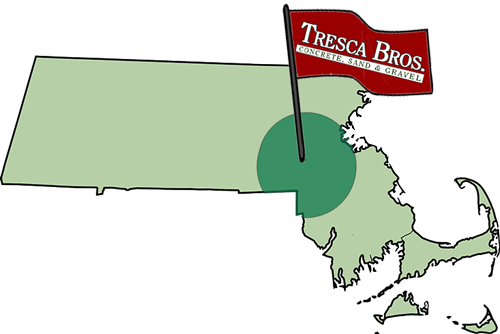 Tresca Brothers delivers high quality fresh ready-mix from our Millis-Medfield, MA dispatch center. No matter how big or small your concrete job is, we have a large fleet of concrete trucks ready to deliver you the goods when you need them. We have a variety of sand, gravel, & aggregate products for all types of projects. Call us today for crushed concrete, washed stone/pea gravel, backfill sand, or pipe/trench sand. Need gravel or crushed stone for a road base? Perhaps sand or gravel for an aggregate rock bed for a structural foundation. Tresca Brother's has just what you're looking for. No matter what your construction needs are, we have the finest gravel & sand materials for whatever construction project you need to tackle. Are you working on an excavation project and need to build a retaining wall fast? Try our unique interlocking concrete block products. This durable, attractive and labor saving retaining wall system will cut hours off your excavation projects. Construction Equipment Guide wrote a very nice article about Tresca Brothers Concrete for our Public Service efforts. 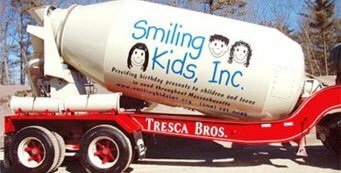 Tresca Brothers featured in Work Truck Magazine back in 2008 for raising awareness to New England charities.